(CNN) -- Christopher "Dudus" Coke, who controls the impoverished West Kingston enclaves now blockaded by gang members, is likened by experts to both Robin Hood and Pablo Escobar. But comparisons to the hero of Sherwood Forest and the one-time Colombian kingpin are not mutually exclusive. 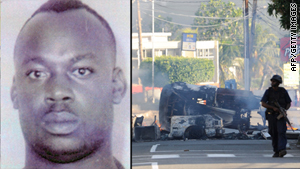 Coke, 41, rules via a combination of violence, corruption and philanthropy, experts say, and recent unrest in the Jamaican capital over the search for him results from competing interests: those who want him handed over for drug crimes versus those who consider him a benefactor. "He lives in a poor area, and because of his sale of cocaine, he basically plays the Robin Hood role," said Jamaican-born attorney David Rowe, a University of Miami adjunct professor with expertise in Jamaican extraditions. After nearly a month on the run, Coke was arrested Tuesday outside Kingston, police said. He is wanted by the United States on gun and drug trafficking charges. Jamaicans, many of whom live in abject poverty in Kingston, are reluctant to help the government extradite Coke to the United States, experts say. "They don't know, if he's extradited, who will be there for them. There are mothers wondering, 'Who's going to buy my child lunch?' or 'If I get sick, who's going to pay my hospital bills?' " Rowe explained. Coke and his gang hand out sandwiches in the streets, send children to school, build medical and community centers -- "all the things to ingratiate himself that Pablo Escobar used to do in Colombia," said Larry Birns, director of the Council on Hemispheric Affairs, a think tank specializing in U.S. policies in Latin America. In August, a grand jury in New York handed up an indictment alleging that Coke and his Shower Posse conspired to distribute cocaine and marijuana in the United States. The indictment also accuses Coke and his cohorts of trafficking firearms. News reports say the posse is so named for its penchant for raining down bullets on its opponents. The Jamaican government initially balked on extradition, and in March, Prime Minister Bruce Golding issued a statement denying claims that his government was not cooperating with U.S. counternarcotics efforts. Instead, he said, a wiretap employed in the American investigation violated Jamaican law. "The Jamaican government, rather than summarily refusing the request, discussed with the U.S. authorities the breaches that had occurred which made it impossible for the minister, being aware of such breaches, to issue the authority to proceed," Golding's statement said. In May, Golding delivered a different message, urging citizens to "allow the courts to deal with the extradition matter." The violence resulted in a state of emergency in Kingston in May, with gang members battling police, subsequently unfolded. His real name is Michael Christopher Coke, but his aliases include "Paul Christopher Scott," "Presi," "General," "President," "Duddus" and "Shortman." He controls a Kingston neighborhood called Tevoli Gardens, which the U.S. government calls a "garrison community" barricaded and guarded by his gunmen. Coke's gang allegedly imports weapons at a wharf adjacent to the neighborhood. Rowe said Coke's organization uses "mules" -- often women smuggling drugs internally -- to distribute cocaine along the U.S. Eastern Seaboard. Every major city on the East Coast has Shower Posse representatives, and there is evidence the gang has a presence in places as far away San Francisco, California, and Alaska, the professor said. Though Jamaica produces a great deal of marijuana, it serves only as a trans-shipment point for South American cocaine bound for the U.S., he said. Birns said guns purchased in the United States are shipped back to Jamaica as well as other locales where cartels need to "impose their writ." The guns being used in the Kingston revolt are probably from the United States, Rowe added. With an embattled economy, corrupt politicians and a general lack of public services and security, "Jamaica has become a sort of drug island" servicing not only North America's appetite but also the African market, Birns said. Birns said Coke, the son of accused drug lord Lester Lloyd Coke (aka "Jim Brown" or "don dadda"), who was burned to death in a jail cell in 1992, rose to the top of the drug trade amid the turmoil. "He is the predominant, he is the triumphant gang leader who has emerged from the drug wars. He has become the Mr. Big of drug trafficking," he said. Coke benefits from what Birns calls "the megalithic levels of corruption" in Jamaica. In a narcotics report this year, the U.S. State Department said that "pervasive public corruption" as well as corruption at Kingston's ports facilitated the movement of drugs and money through Jamaica. "Corruption remains a major barrier to improving counternarcotics efforts," the report said. Rowe said Coke enjoys connections within the country's ruling Jamaica Labor Party, of which Golding is a member. Also, Rowe noted, a JLP senator, Thomas Tavares-Finson, recently stepped down as Coke's lawyer. Tavares-Finson also represented Coke's father before his death. Rowe said he believes that, more than protecting Coke, JLP officials are concerned with protecting themselves. The grand jury is still investigating Coke, Rowe said, and Golding "believes Coke will cut a deal with prosecutors to testify against senior government members." A similar protectionism may have been don dadda's undoing. A 1992 Newsweek article on the reportedly accidental death of Coke's father stated, "The assumption in Kingston is that friends in the Shower Posse decided that he would be a better dead myth than a live witness in Florida." Birns said it would be interesting to watch the extradition proceedings play out. The United States "has been taking a very delicate road," because any action exacerbating Jamaica's tenuous economy could set off a "large-scale illegal migration of Jamaican nationals to the U.S."
At the same time, the Obama administration needs to show that its recently announced drug-control strategy is more than mere rhetoric, he said. And while Jamaica may be reluctant to hand over one of Kingston's favorite sons, the country is "extremely vulnerable to U.S. leverage," Birns said. Unlike in its drug-war partnership with Mexico, Birns said, the United States has few Jamaican officials who it feels are impervious to intimidation or coercion by Coke, making it impossible to find a judge who could "withstand the temptation of bribes or the fear that their children will be kidnapped." "That is why extradition is so important to the United States," Birns said. "If he were jailed in Jamaica, [Coke's allies] would free him in a day."